What's up, you guys?! It's the last day of this week's COTD, and what better way to end it than to talk about psycho nuns?! 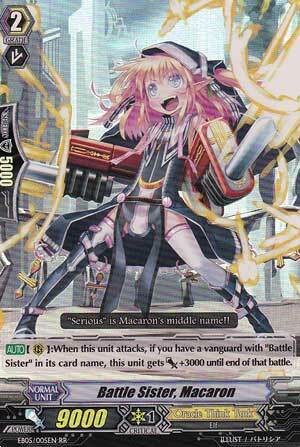 [AUTO](RC):When this unit attacks, if you have a vanguard with "Battle Sister" in its card name, this unit gets [Power]+3000 until end of that battle. ...so in short, we have a Burning Horn Dragon clone of the Battle Sister legion. Overall, this is a pretty solid card especially with the small amount of Battle Sisters that are out currently in the TCG; putting every Battle Sister in x3-4 makes it so that Macaron here can always go in alone at 12,000 and even more with the correct booster. It's only good in its own legion, but that's where it shines the best.